Well, as perfect as an almost-7 month old's eyes can be! Last week, Bobby and Maya had their 3 month check-up with Dr N, their ophthalmologist. He said that they looked great and doesnt want to see them for a year! Which means we are starting yearly appt's! (We knew that, because of their prematurity, they would always need yearly appt's. But we expected to be seen in 6 months and then be cleared for 12 months, so this was AWESOME news!). Yesterday, we had Maya's three month appt with the retinologist. This is the one that scares us because he is the one who really sees the ins and outs of her eyes. Well... He gave her a clean bill! He said that her eyes look great, wants to see her in 6 months, and then, we'll go yearly with him as well! It was like letting out a deeply held breath. This was such good news. It's amazing how quickly time moves. A moment ago, we were watching Nicholas and Sophia on the ultrasound in Dr. Lee's office for the first time. But that was two and a half years ago... And, two years ago today, many of our family and friends said "hello" and "good-bye" to them, all at once. 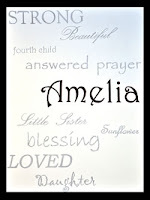 If you havent "met" Stephanie and her beautiful daughter Amelia, please head over to her new site, Beyond Words, to see the beautiful grief art she creates and to read her story. "What's in a name? That which we call a rose by any other name would smell as sweet..."
It struck me today that Nicholas, Sophia, and Alexander will live on, not just in Bobby and Maya or in Peter and I, but also in name. Each of them has a cousin, of their generation, who will carry on their name in one way or the other. My nephew's middle name is Nicholas; one of my new nieces is Sophia; and one of Peter's cousins gave birth to a little boy in December whose middle name is Alexander. While I dont necessarily think that the names were given in memory of our children, it's heartening to know that those children who would have been less than 2 years apart from our three little saints, will bear those names and, perhaps one day, pass them on to their children or grandchildren, keeping them alive for generations to come. It's hard because, so often, whenever I've seen or heard another child named Nicholas, Sophia, or Alexander, it's been painful. I should have expected it; with the exception of Gaea, their first and middle names (Peter and Nathaniel are the other names of the boys), their names are fairly common, or, at the very least, not uncommon. It isnt surprising that other children will share those names. Hearing them in supermarkets or department stores or, when I was working, during storytimes or when children checked out books, was a stab in my heart. Even the other day, when I took Bobby and Maya to the playground, I heard a woman calling her toddler to her and, as I heard her yell "Nicholas", my heart jumped up in my throat. I asked my MIL the other day if it was hard to see Bobby sometimes, as he shares the nickname of her baby brother who passed away in the early 50s at the age of 4 and the name of her son, who died at the age of 7 and who, in so many ways, resembles not only Peter but Robert as well. She told me that no, it wasnt hard, because it was a way that they lived on. Bobby, of course, shares a genetic relationship with them, but that it was more than that. That it was an intangible piece of them that would continue. I somehow think that even had we adopted Bobby and that genetic link was missing, she would have felt the same way had we bestowed that name upon him. I thought of that today as I was pondering names. It could always hurt, I suppose. I could always feel like we have some sort of ownership of their names... That, since they died, it's only fair that we keep something... That their names are ours... That other people shouldnt use them... But their names are beautiful. They are sacred and perfect, just like they were... Just like they are. How beautiful that other children hold those names and all the wonder that they possess... That, perhaps one day, they will look at their family tree and see that they had cousins who also had those names... That those cousins watch over them with an extra special love because they share that bond. Well, I'd best get myself to bed... We are having a surprise birthday party here tomorrow and I still have some straightening up to do before I can pour myself into bed. Info is still sporadically coming in, but as of right now things seem to be really well. My SIL was approximately 33 weeks with the girls but it really looks like they are doing great. They are breathing on their own and, although they have IVs and temp/HB probes, they look very healthy. I'll update as I get more information and I am so thankful for your thoughts and prayers for my nieces and our family. (My dad this morning said that he's sure my mom and stepdad have had enough worry over the last 2 years that they are probably just so relieved to have no child pregnant at this very moment!). My beautiful nieces weighed over four pounds each, which puts them out of the woods for a lot of preemie issues. 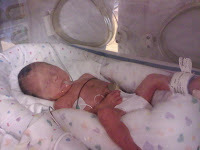 Sophia (yes, Sophia :) ) was born first and weighed 4lbs 6oz. Her twin sister, Grace, weighed in at 4lbs 2oz. Grace, especially, looks like my step-dad and brother. Both girls are just beautiful... I keep telling Maya that she now has two cousins who are light skinned and light haired too! She's not alone in the fair department any longer! Well, my heart is relieved that M and S's girls are doing well. Hearing about anyone going into preterm labor makes my heart ache and worry. I was leaving church when my mom called to tell me and my heart just about stopped. They were due to c/s in mid-April and all I could think of was "It's too soon...". Even knowing that many triplet and quad moms expect to go in the early 30s, it still terrified me. I dont think that anyone who's ever had PTL or loss isnt worried. Even when expectations are good. I am just so grateful for everyone's prayers and warm thoughts. Really. Time to put these little ones down and go clean up the kitchen. Post lunch and dinner clean-ups are best before the food dries all over their bebepods (which ROCK) and my counters. My nieces were born moments ago! I dont have too much news, just that they are blonde, beautiful, and were being placed in incubators. But so far, so good! Keep those prayers coming!!! My (step)brother and sister-in-law are currently in preterm labor with twin girls. The girls were due in early May and, to my knowledge, no steroid shots were given to help mature their lungs. Please say a prayer for my new nieces and their parents. I made you a delicious lemon cake with a lemon cream glaze. :) I love you, cuddlebug. Have a piece of heavenly lemon cake and know that we are all remembering you and holding you close to our hearts on the sixteen month anniversary of when you were born and lived on this world for the shortest of times... and yet, the longest of times... We love you so much and will see you again one day. I've had some questions about corrected age versus birth age. And, interestingly enough, it came up yesterday at the developmental clinic. I wrote a post about it on our RLC blog, but I wanted to share an excerpt here, as to the importance of CA, even though we dont often use the term because of Bobby and Maya's developmental/birth age. Because we have been so blessed with good health and no developmental delays, we dont adjust their ages for prematurity. The state assessors that came told us that, developmentally, we didnt need to, and our pediatrician has told us that based on their sizes (they began life outside the womb at 2lbs13oz and 2lbs5oz, respectively, and are now almost 17lbs and 12lbs) and the passing of milestones on par with full term babies, it was unnecessary. So we tend to "forget" corrected age. But something that the NICU doctor we were talking to yesterday said really struck a cord in us. In spite of their developmental ages and sizes being on par with 40 week babies, the clinic will always assess them via corrected age. Because they are the brain age of a 361 day old baby. Or, when you subtract 266 days for a full term pregnancy, the age of a 95 days-outside-the-womb baby: a 3 month old. It may not be initially clear, but this NICU doctor said what those of us in the pro-life community have been saying for years. The womb matters. Life in the womb matters. It makes a difference. A huge one. As any preemie parent can tell you, watching your baby in the "mechanical womb" of the NICU is a life-altering experience. By the grace of God, we are blessed with children that did just as well- or maybe even better- outside of my womb, as they did in it. But their age- their "true" age- the age that the specialists weigh them against- is 361 days. Their 174 days in the womb and (as of yesterday) their 187 days out of it. 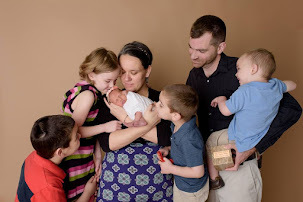 Our pediatrician had told me that the kids were doing great and that they were passing their six month milestones like full term infants, so to try not to worry. And... she was so... RIGHT! The specialists and doctor were looking for them to perform at 2mo-3mo and they measured 4mo-6mo!!! YES!!! And they werent even fully cooperating! Maya refused to "talk" and neither would roll over, and yet, they still did soooo well! They said that we are doing very well and that the babies are doing far beyond what they expected. They were thrilled that the kids can stand and are trying steps. They loved that they sit so well and play with objects. I didnt realize until after they were telling us what was going right, that I was holding my breath! Because I was in her general area, I visited my friend who is pregnant with quads. She looks great! She is on strict bedrest and is such a trooper! We are all praying and hoping for at least 7 more weeks, but the more, the better! 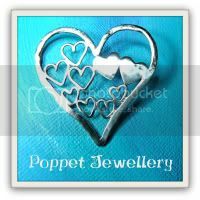 If you get a chance, pop by her blog and make her smile with your wit! I was reading to the kids tonight, a book called My Little Sister Ate One Hare, and Bobby was falling all over himself laughing! I thought he was going to make himself sick! I ended up reading the story twice because he fussed once it was over!!! I highly recommend it... Just not for a bedtime story! And, speaking of bedtime, I think it is time for me to turn in. I am so tired! I wish my child hadn’t died. I wish I had him back. I wish you wouldn’t be afraid to speak my child’s name. My child lived and was very important to me. I need to hear that he was important to you as well. If I cry and get emotional when you talk about my child, I wish you knew that it isn’t because you have hurt me. My child’s death is the cause of my tears. You have talked about my child, and you have allowed me to share my grief. I thank you for both. 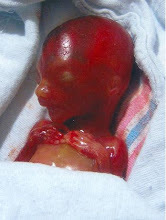 I wish you wouldn’t "kill" my child again by removing his pictures, artwork, or other remembrances from your home. Being a bereaved parent is not contagious, so I wish you wouldn’t shy away from me. I need you more than ever. I need diversions, so I do want to hear about you; but I also want you to hear about me. I might be said and I might cry, but I wish you would let me talk about my child, my favorite topic of the day. I know that you think of and pray for me often. I also know that my child’s death pains you, too. I wish you would let me know things through a phone call, a card or a note, or a real big hug. I wish you wouldn’t expect my grief to be over in six months. These first months are traumatic for me, but I wish you could understand that my grief will never be over. I will suffer the death of my child until the day I die. I wish you wouldn’t expect me "not to think about it" or to "be happy". Neither will happen for a very long time so don’t frustrate yourself. I don’t want to have a "pity party," but I do wish you would let me grieve. I must hurt before I can heal. When I say, "I’m doing okay," I wish you could understand that I don’t feel okay and that I struggle daily. I wish you knew that all of the grief reactions I’m having are very normal. Depression, anger, hopelessness and overwhelming sadness are all to be expected. So please excuse me when I’m quiet and withdrawn or irritable and cranky. Your advice to "take one day at a time" is excellent. I wish you could understand that I’m doing good to handle him at an hour at a time. I wish you understood that grief changes people. When my child died, a big part of me died with him. I am not the same person I was before my child died, and I will never be that person again.I wish very much that you could understand – understand my loss and my grief, my silence and my tears, my void and my pain. But I pray daily that you will never understand. I received this email from Nadya's mother. Thank you all for keeping this family in your thoughts and prayers!!! Praise God with us! Nadya came home Wednesday afternoon. We do have a home monitor for now, which helps put us at ease. At this point the alarms have been high heart rate when she is crying or loose leads. We are adjusting to each other and time schedules. At her pediatricians appointment Thursday, she weighed 6 lbs, 7 ozs. She will have a follow-up Thursday, March 25 to make sure she is gaining weight and eating well. Also on March 25, she will have a follow-up with the eye doctor. So far, all of her eye exams were good. May 5 is a follow up appointment with the Neonatal Associates who took care of her for 78 days! God has richly blessed us with her life and Nadya had few complications. We know that was due to the hand of God through all of your prayers and the great nurses He gave to take care of her and us during that time. As the day was approaching that she might be able to come home, the sadness of not seeing and interacting with those people everyday became more real. There were conflicts, but isn't there always, especially in stressful times such as this? Those wonderful women truly care for all the babies in the NICU and their parents! They were great in teaching us how to take care of Nadya in diapering, feeding, bathing, taking her temperature, dressing, etc. They would answer our questions or make a note to ask a doctor next time one was around and have the next shift tell us. It is so nice to have more time at home and not have to drive 30 minutes each way 1-2 times a day to see her and care for her. Although, we sleep less at night taking care of her, it is good to be home! It's official... Froggie and Doggie have been retired. A friend of ours got these Wubbanubs for the kids for Christmas and they loved them. Too much. Since you cant wash/dry stuffed animals due to the risk of mold, three months is about the lifespan of these little guys. (Of course, the soothies could live forever... 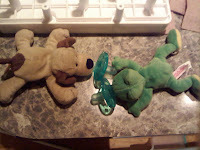 So I cut them off, washed them, and added them to the rotation of binkies!). Time to whip out Monkey and Duckie (their Christening gifts!). Maya, who is desperate to walk and will take a few steps if we give her balance by holding her hands, stood unassisted for about 2 seconds. I cant even believe it. She's not even seven months old and, already, she's gaining independence... Where has the time gone? I'd better just cuddle this sweet girl, who is sleeping on my chest right now, as much as I can before she can run away! A few days ago, the U.S. Census form came in and, like the good, upstanding gal I am, I opened it and filled it out. Person 1... Me.... Person 2... Peter.... Person 3.... Maya.... Person 4.... Bobby.... and then, it was over. I said who we were, what we were, and then, it was done. We were counted. Our family did our part for the government. And then it hit me like a ton of bricks that Nicholas, Sophia, and Alexander will never be counted. They will never be a name on a Census form. My great-great-grandchildren will never flip through old documents and see something and say "Look, there is great-great uncle Nicholas's name"... No. Never. When Peter came home, I mentioned that the form came in and that I filled it out... That it only wanted the names of people who would be living in our home as of April 1, 2010. He had the look that I'm sure I had that said they wont be counted... We both knew it. It hurt. But we knew this was going to happen. Just like we know that, when we take our photos for the parish directory, there will only be four faces and only four names, when we see our family as much larger. Yesterday, as we were sitting on the couch, Peter softly said. "Robert wasn't counted either." His voice was tender and he reached out for my hand, when I began to cry, understanding what he meant. The Census would have been conducted months before Robert was born, so he wouldnt have been a resident of the house in April 1980 (just a resident of the womb, which isnt considered...) and, by the time the 1990 Census would have been done, he had been gone for over two and a half years. He wasn't counted... And yet, he lived a life no one could ignore, a life full in its youth, a life that lived on after he died. Guess who napped in his big boy bed today? I know... craziness... I used this great little bolster bumper thing than a friend got them for their Christening. (imagine a towel with a bolster on each side to make sure the baby cant roll off the bed... I think they came from Ikea). So, I put him down and he took his morning nap there! It was so rough to think that, one day, they will be out of the nursery and in their own 'big kid' room. We've created rooms for our children. For Nicholas and Sophia, we created the room we now refer to as the "big kid" room. It's a large bedroom with a double closet, and is where our guests usually stay. There is a toy box and book case that were Peter and Robert's when they were kids. We also have their bunk beds (set up right now and two twins). I love this room. Over each bed, there is a crucifix (also Peter and Roberts) and a picture of the Virgin Mary and Jesus. There is a baked mud Peruvian mobile that hangs from the ceiling in between the beds. It's a simple room, but it's beautiful. The bamboo shade lets in the light, and the taupe walls against the dark wood beams on the ceiling give the room a peaceful feel. For Alexander, we created the nursery. This room is an offshoot of our bedroom that was initially built to be a master bathroom, but when we moved in, was just 2x4s and no walls. There is an enclave with a bookcase, a lamp, and the hamper. My rocking chair, which was actually Peter's paternal grandmother and rocked Peter's dad (along with his uncles, aunt, cousins, him, and Robert), sits in front, across from the crib. There is a tall dresser/highboy and a wide dresser that doubles as the changing table. We painted the walls a color called koi pond that shows up as a sage green in the light and a deeper spearmint in the dark. It's a small room, but walking into it is like walking into another world, a world full of peace. Over the crib is a painting of an elephant that my dad painted when we were pregnant with Nicholas and Sophia; over the changing table/dresser are three hearts (one for Nick and Sophie, one for Alex, and one for Bobby and Maya) that my MIL made, along with birth announcements that Bobby and Maya's godsister drew for them. By my rocking chair, is a wood carving we bought when we were pregnant with Alexander, of a mother cuddling her child in her arms. Although we dont spend much time in this room, I enjoy the stillness when I am there. Maya and Bobby inherited these rooms. We always knew they would. Nurseries are commonly passed from child to child, and, in houses with limited space, it isnt uncommon that children share bedrooms. But they dont have their own space... A space we made "just" for them. We've started creating their homeschool area in our upstairs loft. While future children may use it as well, it is the space that we are making with them in mind. And I am so excited. Our loft is a decent size space, with a large laundry closet for our W/D. It is the space you enter when you come up our stairs. You pass through it to get to our upstairs bathroom and storage space, as well as to enter the hallway to go to our bedrooms. There are two perfect spaces for school desks, so that Bobby and Maya can each have their own special areas. In the middle, we are going to place a square or round table with chairs around it for group school time. And, on the wall between the two large windows, a bookcase for our school materials. Over our W/D, I have a long shelf, so I can use that for a tote of developmental toys if I need to, and the area gets soooo much natural light from the 3 windows (plus the one that shines in from the storage area). I've been looking for the perfect desks and, after I shared plans with Peter's parents, they found gorgeous ones that they've decided to purchase for the kids for their first birthday. I've been looking for a bookcase and group table for us, and I think I've found two that I like but I'm not sure... I dont want to go broke, LOL! 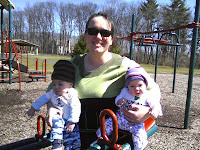 We enjoyed the beautiful weather we had yesterday with TWO walks to the park! The first we took with Peter's mom, the second with Aunt Sarah. What a lovely time! I love spring!!! A book I ordered for the kids came in today. It's called Angel in the Waters and leaves me speechless. I highly recommend it. Well, I suppose I'd better turn in if I expect to get up and take these little ones to their second storytime tomorrow! We've always wanted to homeschool, since well before we had children to even consider educating! We've debated on doing the PA virtual charter school, using the Seton or Catholic Heritage curriculums, unschooling, doing traditional or classic homeschooling, or creating our own curriculum. Last night, my husband suggested looking into Montessori homeschooling. We were aware of the Montessori method, but had never investigated the model as it related to homeschooling. I've ordered the recommended text (The Joyful Child) for homeschooling infants through age three, using the Montessori method, in addition to The Complete Montessori Teaching Curriculum for Infants and Toddlers. One of the things that has drawn us to Montessori homeschooling is the fact that they have done research in educating infants, even prenatally! Also, this isnt a curriculum that we need to follow step-by-step, so the flexibility that we are looking for is there. We will, most likely, order textbooks from CHC or Seton because we do want to integrate religious studies into their secular studies, but we also feel a need (in part because of Peter's scientific background), to make sure that they have a diverse education. Even though they will be brought up Catholic, they will be raised with an understanding and (if we are lucky) a love of all different religions and customs. Right now, Bobby and Maya are six months old. I've gotten quite a number of "how can you homeschool a baby?" questions. Obviously, we arent sitting them down at a desk and giving them homework! But there is so much education in play. Songs and conversation teach them language and, because their minds are sponges right now, songs and conversations in multiple languages give them the gift of being bilingual or even trilingual. Holding their hands and moving them over paper teaches coordination and, as they are becoming more aware of words and letters, teaches primitive penmanship. Hand motions and directed play teaches hand-eye coordination. Physical therapy and practice walking teaches balance. Loading them into the stroller and walking around the block not only gives them air and gets them outside, but opens their eyes to the beauty of nature. Taking them to church, watching religious cartoons, and reading the Bible with them teaches them our faith. They may not be able to articulate it today, but their minds are working. It may sound like a lot, but when you break activities into a few minutes at a time, you work within their attention span and it allows you to expose them to so much. I feel so lucky to be able to stay home with them and educate them; I am grateful to know so many who homeschool successfully; and I am so blessed to have a husband who supports us financially, emotionally, and spiritually. Bobby and Maya have been alive for one year. One year ago, we conceived them and they came into being. Not Peter. Not me. But them. All that makes them who they are. In a tiny speck. Maya's eyes were blue... Her hair and skin were light... She was a she... Bobby's eyes and hair were brown... His skin was olive... He was a he. All in that moment. Even before she had hands, Maya's DNA determined her long "piano fingers". Before he had a face, Bobby's cute "chipmunk cheeks" were meant to be. One year. 365 days. Wow. It strikes me that Bobby and Maya were born 6 months ago and conceived 12 months ago. They have been on the outside for their life on the inside. Even though they were, through pregnancy dating, 27w5d, conceptually, they were 25w5d in my womb. They have now lived beyond that. They were 25w5d on the 9th of this month, a day before their 6 month birthday. Wow. I am still in awe of this beauty. Of the beauty that happened one year ago. We will always celebrate this day as the day that our children came into being. And what a beautiful day it will always be. I'm not pregnant. And, before you all think I am NUTS, we werent trying to cycle (however, because we dont believe in birth control, we are open to life if it happens). I saw Dr. B. for my annual in mid-February. At that time, I still hadnt menstruated, which isnt uncommon, since I go years between menses. We talked about the ramifications of not cycling, which include a much higher risk of cancer and early hysterectomy. He advised either monthly birth control pills, which we werent okay with (even if they werent for the express intent of preventing pregnancy), or progesterone therapy. Since I was unable to induce a period using Prometrium with Dr. Lee, Dr. Bailey wrote a prescription for Provera. Quarterly, I was prescribed a ten day dose, with menstruation due within 5-7 days of stopping the pills. In order to make sure I wasnt pregnant before hand, I was to take a test before starting the pills. So, March 1st, I took a test and then popped a tiny pill. And, yesterday, on the 12th, I got my first monthly in a very long time that wasn't miscarriage or missed cycle induced, in FOUR years. But I digress... The point of this post wasnt to share the TMI of my menstrual cycle... It was that BFN. Over the years, I've taken a variety of pregnancy tests. Some you hold in your pee, others you drop a dot on, some tell you "NOT PREGNANT" (just so you can be extra sure), others have the single line. I scored negatives on pregnant cycles and then, a year ago, had those beautiful two lines on (God only knows how many) tests to indicate Bobby and Maya. And suddenly, I was excreting hCG and all was well... Those negative tests, however, broke my heart every single time. I would hope and hope and hope... And then crash. One little line- and one nonexistent one- could destroy me like nothing else. They were a sign that I was broken... That I was infertile. All I wanted was two lines... That elusive BFP. I cried at every BFN, brokenhearted that, even though I "thought" I was pregnant (after all, why would I run the risk of the test otherwise), only to be told, emphatically with the digitals, that I wasnt. That I was a failure. That the one thing I wanted more than anything in the world, I couldnt have. Sitting in the bathroom, waiting for this test to run, I pondered the "what if" of two lines. Oh my goodness, I thought, how would I manage bedrest with two little ones! But it was a happy daydream, a thought of what a miracle it would be if I were, and then... one line. And I shrugged, tossed the test in the garbage, and went to change out laundry before taking my morning pills. This was the first negative that didnt break my heart. Hell, it didnt even break my stride! I wasnt pregnant- the first time since we started seeing Dr Lee in 2007 that I havent been pregnant within 6 months of being pregnant- and I was okay with that. I wasnt going to cry. My heart wasnt hurting. I was okay. I often think that having living children hasnt changed me from the mother I was when I was an orphaned parent only. But that experience told me that it has. I am different. I dont feel my family is complete; I know I never will. There will always be faces missing from family pictures. But there will be other faces, too... Faces that arent in today's pictures, but may be in tomorrow's. And that will be okay. It will be our life. And I am different. Peter is different. We, as a family, are different. And, for the first time in a long time, I felt like that was okay. I walked down the hallway towards our bedroom and stopped to look at the pictures. There was Nicholas, holding his hands; Sophia, wide smile on her face; Alexander, cuddling up to his blanket; Maya, sucking her fingers; and Bobby, giving the camera a "who's holding my sister if you're holding that contraption???" look. Then, there were paintings of Peter and I, together, so young, smiling... Our family. Ours... Mine and his, his and mine. Perfect, the way God meant for it to be. I looked in on him as I picked up my pill bottle from next to the bed. He was curled up to the warm spot I had left behind, hand reaching for the head that had dotted the pillow, where now a small indention was all that was left behind. And I wasnt going to wake him up to tell him I was pregnant. And all was right with the world, and my heart wasnt breaking. And it was good. All good. A week ago, I got together with a blog friend. We had a great time. We hung out at the house for a bit, and had lunch at my favorite, semi-local coffee shop. She is now on hospital bedrest, so please pop over and over her some warm fuzzies. She's almost 20 weeks and they really want to keep the quads in for 7+ weeks. While your sending those fuzzies, say a prayer too. Your prayers kept us pregnant for 16 weeks on bedrest (7 of which were in the hospital) and got our twins safely here and home. I know you can do it again!!! I received this note from Glenda. Keep those prayers a'comin! Nadya is now eating all foods orally (no tube!) and eats when she wakes (every 3-5 hours). She had a stall this week in weight gain when they stopped adding higher calorie formula to my breast milk, but she picked back up and now weighs 5 pounds, 12+ ounces! She passed her car seat test on Sunday. In our own minds, we thought she might be home already. However, Monday she dropped her heartrate (not while eating), which adds 3-5 days without an episode. Also, while eating 12 hours later, she had an episode and the nurse had to pass oxygen in front of her to help her regain her level and bring her heartrate back up. We have been diligent in asking for a monitor temperarily when we come home and that is now being arranged. Our sweetie pies are six months old today!!! You've gone from barely fitting in your infant carseats with bolsters to being able to ride in your stroller in the "big kid" seats. Sweet Bobby Boy, you were born weighing 2lbs13oz and a little over a foot long. You are over 2 feet long now and weigh almost 16 pounds! Gorgeous Maya Girl, you were born at 2lbs5oz and a little shorter than your brother. Now, you are slightly shy of two feet tall, are walking with assistance, and are over 11 pounds! You can even hold your own sippy cup! Happy 6 month Birthday, Babies!!! What is special about 25w5d? Although pregnancy dating has Bobby and Maya born at 27w5d, they were born 25w5d from their conception nearly one year ago, on March 14th. They have now lived outside of my body for longer they were in it. It is amazing to me. This is from a dear internet friend, Sara, who delivered her son, Anthony, still 2 years ago. For some people, that "piece of paper" never makes a difference, but for parents like us who have lost children, whether it is a certificate of live or still birth, it is one of the few things we have that show our children were here. Many of us have had to fight for that recognition. While I know that we all have busy lives and things going on, take a moment, if you would, to get involved, either through MISS or by contacting your state legislators directly. It takes mere moments to send an email and, even if you havent been directly touched by still birth, someone you know has. I'm writing my representatives today, in memory of my stillborn uncle. Who will you write in memory of? A dear friend from Ireland shared this with me. It's so lovely... Something in honor of our ecumenical services that our parish takes part in during the Wednesdays of Lent. Today was not an ordinary day – For one family in my parish it was a day to say farewell to a beloved one – After ninety years of life family and friends converged on a lakeside village in North Tipperary and filled a beautiful church to overflowing. There they prayed together, sang beautiful songs and shared happy memories of a good and fulfilling life. None of this would this be unusual but we were in a Roman Catholic church and this was a Church of Irelandfuneral! The deceased had lived in the village all his life – He was, like his surviving family, a part of the place - It was his home and ordinarily he would have been buried out of the local Church of Ireland church in the same village. But that church is now a private dwelling and so not for the first time the local Roman Catholic community threw open their doors so that a member of the Church of Ireland could have their funeral in their own hometown – the place they loved in life. No less than three Roman Catholic clergy turned out to show their support and not alone that but the church choir turned out in force and sang the traditional Protestant hymns with gusto that Wesley himself would have been proud of. It was as one family member observed in the eulogy, like playing rugby in Croke Park. It was a beautiful gesture and an example of true Christianity in action. I would like to think we would be as generous if the shoe were on the other foot. But there was more to come. The burial was to take place in the Church of Ireland graveyard which is adjacent to the old church. As I and my fellow clergy led the coffin through the churchyard the occupant of the now converted church, a lady from Thailand, and I presume a Buddhist, though I don’t know, lit dozens of incense sticks along the route the coffin was to take to the grave. Totally unexpected it was intensely moving and impressive. I am not well versed enough in world religions to know the exact significance of this ritual but it just seemed right and was yet another example of the generous respect of one tradition for another. Today truly was no ordinary day – it was a good day for religion – a day on which its true role as a source of reconciliation and peace was demonstrated so very well. Would that it could always be so. Today I had a moment of sweet wholeness. I have no other word for it. For a moment, my heart was free of cracks. Peter's mom came over and we were all tired, so she napped with Bobby and I napped holding Maya. We were cuddled together. I woke up with one of her hands caressing my face while she, in her sleep, nibbled on her other hand's knuckles. It was so sweet. I could feel her breath against my skin, her chest softly rising and falling against me. It was pure perfection. And, for that moment, I felt whole. I was invited to attend two mom's groups, one at our parish (SMG) and one at a neighboring parish in our cluster (CC). I went to the CC one, called The Mom's Cafe today. The group selects a book for the year (right now it is The Domestic Church), reads a chapter each month, talks about it and socializes. It's the first group I've been to. And in some ways, it was easier than I expected and, in other ways, harder. Bobby had a freak out before we left, but a few minutes of rocking calmed him and we were on our way. I got there a little late, but they hadnt started devotions yet. It was easy to just pull up a chair and get involved. The harder part came as we were ending the gathering. One of the women at my table is recently pregnant with #5. She has a 1st grader, kindergartener, 4 year old, and 2 year old, and is due in October. It was apparent that the dont really have issues getting pregnant, but she was happy if a little surprised and was sweet. But it was a hard realization that I (most likely) will never have that spark of surprise, that "OMG, I'm pregnant!" feeling of surprise when you didnt expect a BFP in the first place. The next pang was another pregnant mother, due April 10th, talking about her baby being born in March because she has a "feeling" that the baby will be a preemie. I realize that her baby would technically be a preemie, but it was such a hard thing to handle. I wanted to say "really???" before I caught myself. Life experiences make us who we are. I know that my feelings are results of losing children and having premature babies and our heartaches and our joys. So, I can accept that and be happy that I kept my mouth shut! It's hard, though, knowing that these are the feelings I'll be faced with when going to mom gatherings. I want to go. I want to meet these women. I want Bobby and Maya to have playmates their age. I know that I'll have to grow a thick skin, try to stop feeling like a fraud and realize that I belong there just as much as they do. Wednesday, we're doing our first storytime at our local library (not the library I ran, but the one that we live within the service area for) and back to Wednesday Stations of the Cross, and then, Thursday, Sonja is visiting! YAY!!! I am so excited to connect and hang out!! !